Published in a very limited quantity by the ASC, this 126-page keepsake from the event — which is not sold and has only before been available to Awards show attendees — not only features a complete rundown on all honorees and nominees, but hundreds of historical images depicting cinematographers and their crews at work, complete with detailed caption information that every motion picture aficionado will enjoy. This free digital edition has been made possible by our many ASC Awards supporters and sponsors. With Lifetime Achievement Award honoree Edward Lachman, ASC on the cover (in a photo by unit photographer Jonathan Wenk from the production of the 2007 feature I’m Not There), the book was published for the recent 31st year of the annual ASC Awards. It contains fascinating images showcasing Lachman; Presidents Award honoree Nancy Schreiber, ASC; Career Achievement in Television honoree Ron Garcia, ASC; International Award honoree Philippe Rousselot, ASC, AFC and Board of Governors Award honoree Denzel Washington — primarily sourced from their personal collections. Other historical images are from the ASC’s vast photo archive. Many have never been seen by the public and are being shared here for the first time. Shrouded by clouds of sulfurous steam, director Werner Herzog (with the Nagra and sticks) and cinematographer Edward Lachman (with his CP-16) climb an active volcano that is threatening to erupt. The duo is shooting footage for the documentary La Soufrière (1976) on the island of Guadeloupe. “Werner called me up early one morning from Europe and told me he wanted to make a film about a people who were resisting God, country and an impending catastrophe,” Lachman remembers. “When I got there, I asked Werner, ‘What will happen if it erupts?” He said, ‘Well, we’re sky bourne.’” Fortunately, the pair survived to later make the film Stroszek (1977), in collaboration with his German cameraman, Thomas Mauch. Photos taken by Herzog and Lachman. In this shot by unit photographer Francois Duhamel, director Robert Redford and Philippe Rousselot, ASC, AFC discuss their next move while filming the romantic period drama A River Runs Through It (1992), for which the cinematographer earned an Academy Award and an ASC Award nomination, among many other honors. Ron Garcia, ASC confers with actress Sheryl Lee on the “Red Room” set of the surreal series Twin Peaks (1990-’91), on which he also worked closely with producer-director David Lynch. “I loved Eraserhead and liked The Elephant Man, but I hated Blue Velvet, and when I read the script for Twin Peaks, I didn’t get it and threw it on the floor — I thought it was Peyton Place in the woods!” remembers Garcia. “But when I met David [to discuss the project], I thought he was a sweetheart. He’s a real-life Jimmy Stewart character, and a true artist and filmmaker.” After shooting the series’ pilot, he later re-teamed with Lynch to photograph the spin-off feature film Twin Peaks: Fire Walk With Me. (1992). 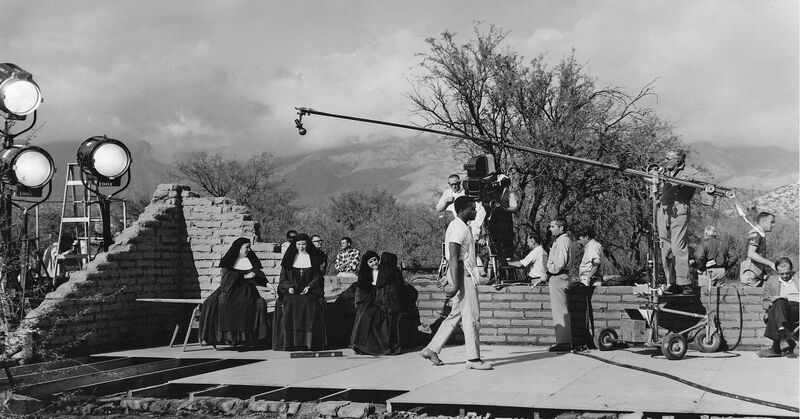 Sidney Poitier earned an Academy Award for Best Actor for his performance in Lilies of the Field (1963), an intimate drama artfully photographed by Ernest Haller, ASC on locations outside Tucson, Arizona. Faced with a tight 21-day schedule, Haller (next to camera, in white, partially obscured by Poitier) and producer-director Ralph Nelson had the benefit of working with a crack Hollywood crew, including operator Fred H. Jackman, Jr. (later ASC), assistant cameraman Richard C. Glowner (later ASC) and gaffer Norman C. McClay. Given the limitations of space in practical interiors, Haller employed lightweight, modified 300-watt aircraft landing lights, dubbed “Garnelites” for enterprising electrician Lloyd Garnell. Here, senior spots are at work for modeling on an overcast day. Setting up a car rig while on location filming Desperately Seeking Susan (1985), directed by Susan Seidelman, are (from left) cinematographer Edward Lachman, operator Francis Kenny, 1st AD Joel Tuber (in background), 1st AC Mitch Dubin and key grip Tommy Prate. “Francis was a documentary cameraman and I convinced him that he should be the operator,” Lachman says. 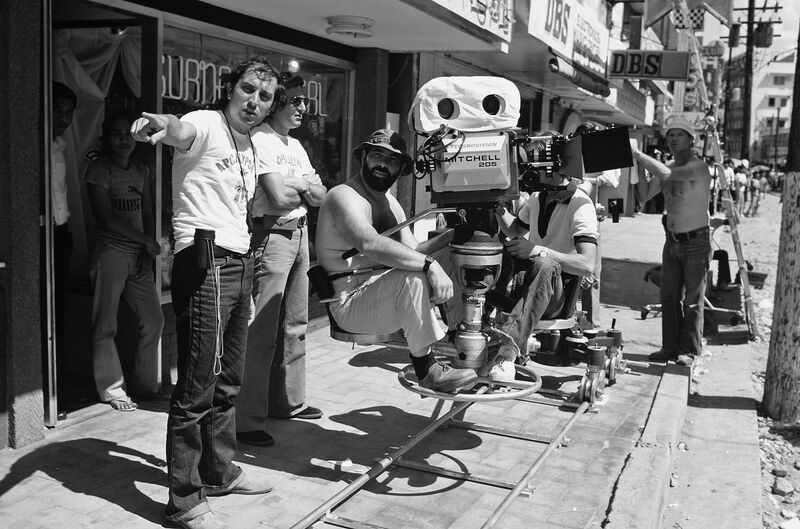 “Susan gave me a break to shoot her film and I immediately went to Francis, who had never shot 35mm. But he had a great sense of composition and rhythm and I knew he could do it.” Years later, Lachman and Kenny would both be invited to join the ASC. This book also contains a complete record of all previous ASC Awards honorees, nominees and winners — all the way back to the first presentation in 1986.